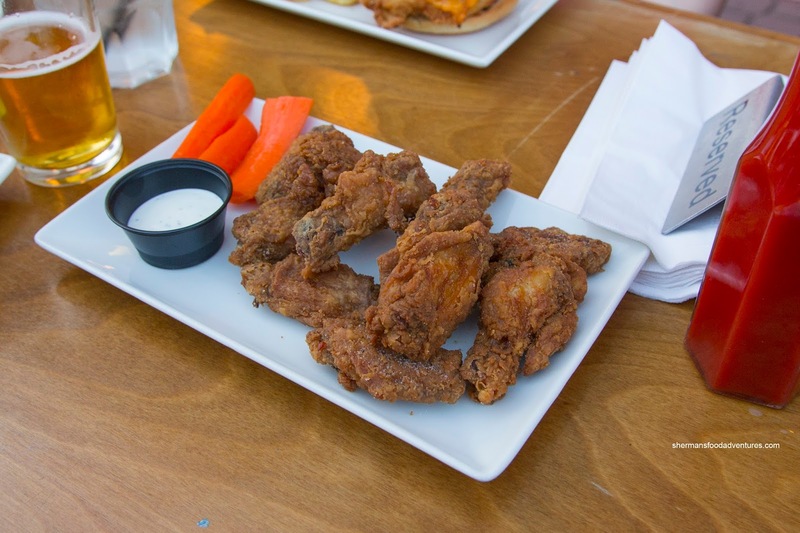 For what seemed like an eternity, the Elephant Walk Pub anchored the spot on 41st at Knight. Yep, a part of it used to be a Chinese restaurant for those who were around during the 80's. I vaguely remember eating there and really, nothing much to rave about. 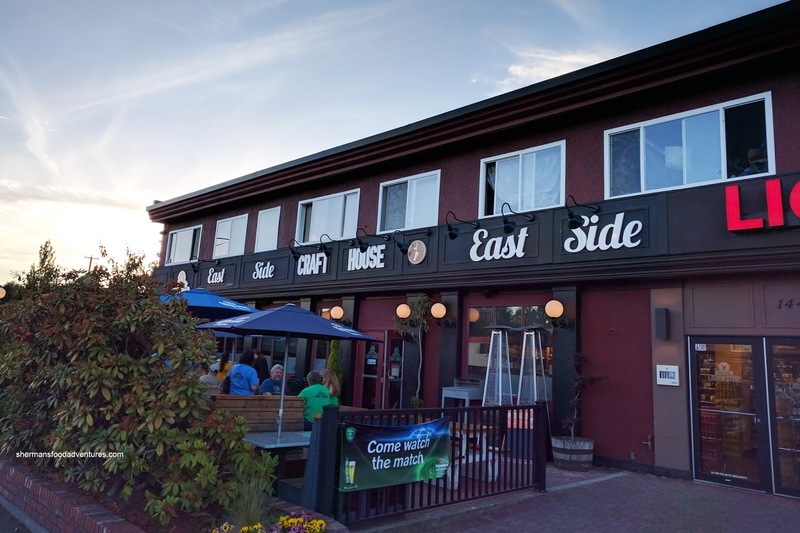 Then one day, the place suddenly changed to the East Side Craft House. Could it be the beginnings of a gastropub? Well, this was our landing spot after Monday night softball as we were needed something non-Asian to eat. R2D2 and I shared the Salt & Pepper Wings to start. They were fried up pretty crispy while the skin was completely rendered. As a result the rest of the wing was rather dry and somewhat chewy. There was a good amount of salt and pepper for proper effect though. 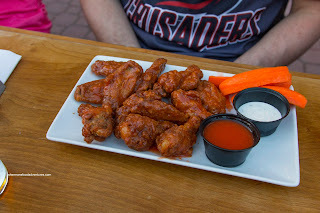 As a side note, the carrot sticks were pretty good as they were not dried out like we usually find with wings. Sens Fan had the Hot Wings and they were aggressively sauced which meant there was more moisture to the wings. The hot sauce was the pretty standard vinegary Frank's Red Hot variety. For my main, I went for the Beef Dip with fries and garlic dill dip. At first glance, this looked good with a boatload of shaved roast beef in an attractive pretzel bun. However, one bite and it was clear that it was beef jerky posing as roast beef. 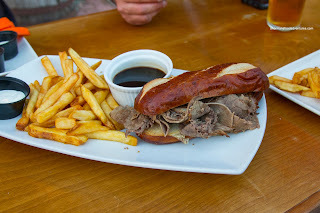 It was so dry and mealy, I had a hard time getting it down despite the silky and flavourful au jus. Surprisingly, the pretzel bun was not overly dense and ended up being the best part of the dish. The side of fries were acceptable being somewhat crispy. The garlic dill dip was an extra dollar and really, what a rip off for a half-filled plastic sauce dish. 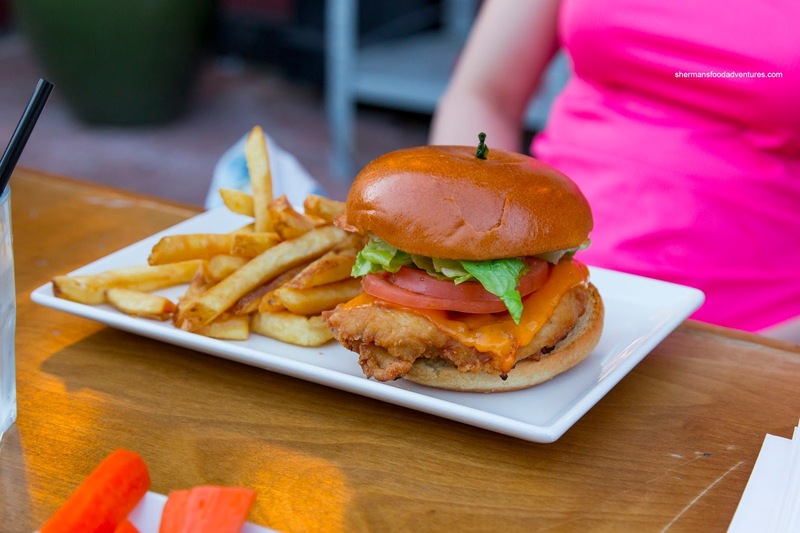 Judes went for the Crispy Chicken Burger and it was decent with moist and tender meat in between a soft brioche bun. R2D2 and Boss Woman each had a version of the Beef Burger and it was also the beneficiary of the soft brioche bun. 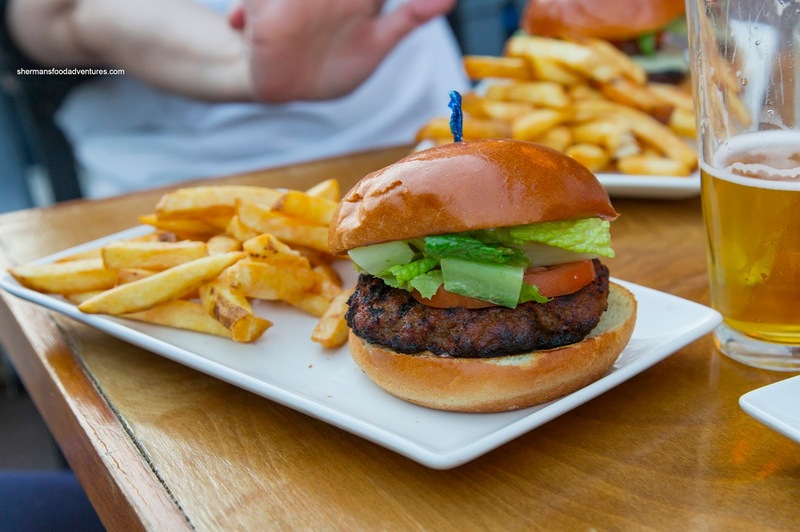 They both remarked how charred the beef patty appeared. It created a crispy exterior that was smoky while the meat itself was not exactly juicy, yet was not overly dry either. One last item at the table was the Bacon Chicken Burger and it featured a grilled chicken breast. 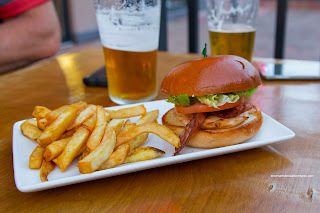 Although not exactly succulent, it wasn't overly dry though and again benefited from the soft brioche bun. Since it was a Monday, they had a burger and beer special for $10.00. Pretty good in my books especially since the burgers were decent. However, my beef dip was terrible and the wings were dry.